Just in time for Valentine’s Day: BIG LOVE! Bring home BIG LOVE! Society for the Prevention of Cruelty to Animals Los Angeles (spcaLA) announces $50 adoption fees for big breed dogs until the end of February at all spcaLA pet adoption centers. Now until the end of February! 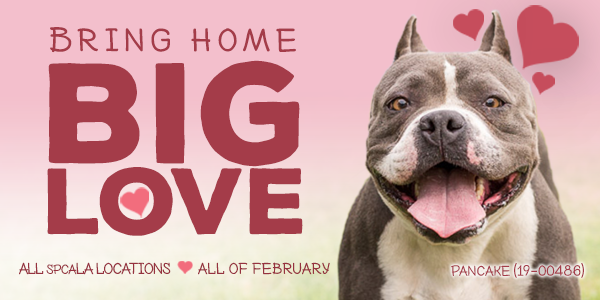 The BIG LOVE $50 adoption fee special is for qualified adopters. The adoption includes a coupon that may be applied to one private training session or a group training class with the spcaLA Training Department. Larger breed dogs currently available for adoption include Shepherd mixes, Lab mixes, Husky mixes, and Pit Bull mixes. To view adoptable animals or spcaLA adoption requirements, please visit spcaLA.com.